President-elect Donald Trump’s first White House hire tells you everything you need to know about his commitment to his campaign’s bigoted message. 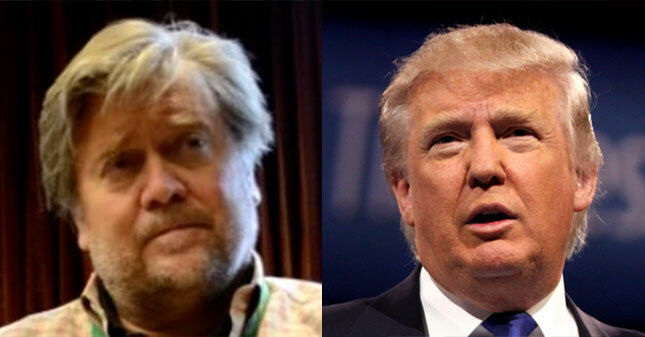 Stephen Bannon, an anti-Semite who ran the white nationalist “alt-right” website Breitbart News before taking a leave of absence to become the Trump campaign CEO, will be Trump’s chief strategist and senior counselor. On November 13, Trump released a statement announcing Bannon’s hiring. The same statement noted that Republican National Committee chairman Reince Priebus would become Trump’s chief of staff. While White House chief of staff is typically the most senior position in the White House, the press release named Bannon first and described the two as “equal partners” in the Trump administration. Let us be clear. The hiring of Steve Bannon as a WH policy adviser is exactly the same as hiring David Duke. Please don’t normalize this. The hires of Bannon and Priebus together signal that Trump’s White House will combine the traditional Republicanism of Priebus with Bannon’s brand of ethno-nationalism. Prominent Republican figures like Speaker Paul Ryan are signaling that they will allow the normalization of such a figure, openly praising Priebus’ hiring while ignoring Bannon rather than speaking out against him. Just today on CNN, Paul Ryan said he had never met Bannon, had no comment on him serving in Trump’s White House, but declared that he “trusted” Trump. Ryan’s agnosticism about Bannon beggars belief: Breitbart News under Bannon had led a multi-year campaign against Ryan, including declaring Ryan a Clinton supporter who shares her “globalist worldview” just weeks ago. Less than a week after Trump’s electoral victory, many reporters still seem confused about just what will come from a Trump administration. If they want to know what Trump truly has in mind for the country, they need to look at Bannon and his bigoted website. This entry was posted on 11/13/2016, 9:34 and is filed under Uncategorized. You can follow any responses to this entry through RSS 2.0. You can skip to the end and leave a response. Pinging is currently not allowed. I dont know much about Stephen Bannon, what are his views of Arabs and Palestine? “Break it too them gently”….is more than a song. A good move of the rook if used well. Or, if you prefer, “Draining the Swamp”. He’s the chairman of Breitbart, a Zionist mouthpiece with a Jerusalem division that was “conceived in Israel”, and a big supporter of Pam Geller, who he (apparently) interviewed frequently on his Sirius XM program. I’m not saying this is proof that Trump is controlled or anything like that, but Bannon appears to be an enemy infiltrator in his administration. What a lying pile of fake quotes and innuendo. Any time someone doesn’t kiss the feet of Israel, they are anti Semitic. Truth is, Trump actually represents America and its citizens, if you didn’t learn that from the election, you will during his presidency.